Ilya and I used to love going to Bed and Breakfasts. Clearly those days are over, or at least the me eating breakfast there part is (and if you take away the breakfast, then it’s just a bed, so…kind of pointless, right?). We were talking about how those days are over, then Ilya said “well, just give them a list of the foods you can’t eat”; to which I chuckled; I would be better off giving them a list of the foods I can eat, since that list is tiny in comparison to the list of what I can’t eat. In particular, fruit is a tricky business. Many of the fruits that are acceptable on the Low FODMAP food plan won’t fly for most people with GERD or Acid Reflux too. Based on all my research, though, it seems starfruit and papaya are some of the best you can get when it comes to reflux (and both are good for the low FODMAP food plan too). They’re so safe, in fact, that for the low FODMAP foodplan you can eat an entire medium-sized (no more than 94g) starfruit in one serving and 140g worth of papaya which is way more than I thought it would be. Also, basil is said to calm acid reflux, so it’s an excellent addition. The lowfat lactaid cottage cheese seems to be treating me well too due to its low fatness, especially when eating 1/2 serving instead of a full serving. The easiest way to have less of something but feel like you’re having more is to bulk it up somehow, and cottage cheese and fruit always seem to go well together so that’s what I did here. 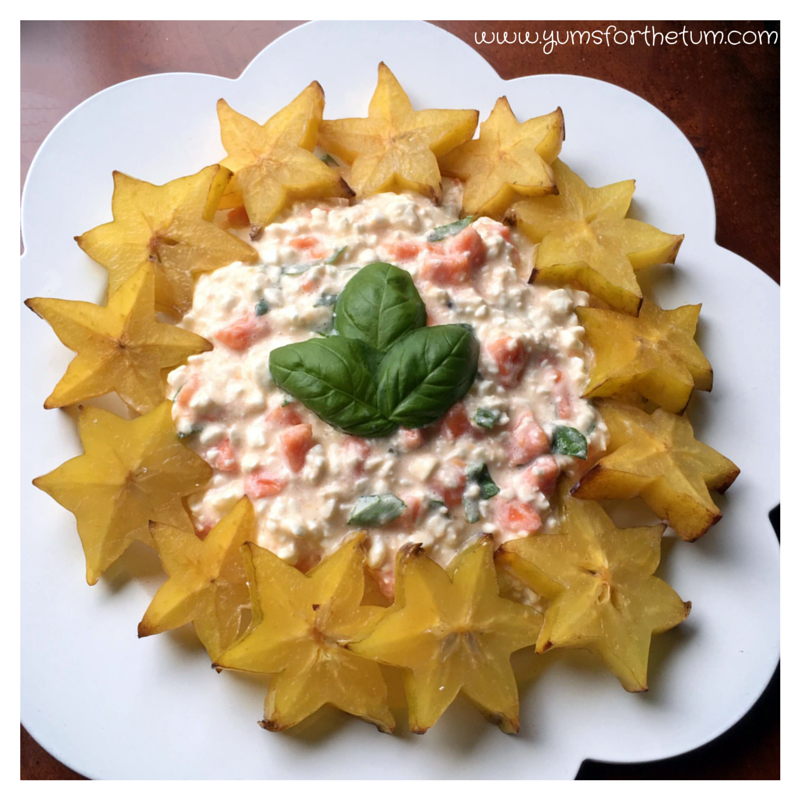 Since basil pairs nicely with tropical fruits, it seemed like a great ingredient to throw in as well for some color, to spice things up a bit and make this even more transformed from regular, boring old cottage cheese. The real challenge with the dietary restrictions comes when figuring out how to serve things. Simply throwing 1/4 cup of cottage cheese in a dish is just sad. Very, very sad. It looks like a miniscule drop of sadness, a glaring reminder of the limitations of what you can eat. Giving it some flair, though, and spreading it out onto a few different surfaces makes it seem like there’s much more to eat and it looks bright and happy! Starfruit were the perfect choice for this project. I found the largest (meaning widest, not necessary longest) ones I could, sliced them up and used them as a kind of cracker for my cottage cheese. Served this way, these would be a wonderful little snack/appetizer to bring to a party or summer gathering. Nobody else will even know they were made based around dietary restrictions, they’ll be too busy talking about the presentation! And I served them to numerous people who had no clue they were eating lactaid cottage cheese (it honestly tastes just like the real deal). Either way, you will most likely need to take a paper towel or two and press them down onto the cottage cheese salsa mixture to sop up some of the liquid, otherwise you might have a mess on your hands. A bright, tropical flavored snack full of IBS and GERD/Reflux friendly (and helpful) ingredients that will make you feel like you're sitting on the island of Hawaii. Well ok, maybe not, but it does taste tropical and is an excellent summer snack! Don't fret if you 're a papaya newbie (I was too!). Just head over to this website for all the information you need (though their picture looks nothing like the papaya I bought... mine was much longer and still a little bit green, but the key is that is had speckled on the outside and was a bit soft - not mushy, though - to the touch). It was far easier cutting/peeling/de-seeding than I thought. If it's at the optimal ripeness, then it will be very juicy, so make sure to have a good amount of work space (and paper towels!). The de-seeding could be messy too, but not if you use a large spoon and hold it over the trash (seed side down) when doing it. Once the "seems scary and daunting but really wasn't bad at all" fruit prep is done, combine the cottage cheese, papaya and basil until mixed together. Try not to mix more than needed, though, because ripe papaya is a juicy beast and it will create more liquid than you probably want in the cottage cheese. Never fear, though, because if you do overmix or it ends up being liquidy, you can always press down a paper towel on top to sop up some of the excess liquid. For individual bite-size servings, lay the starfruit slices flat in an even layer on a serving platter, then scoop some of the cottage cheese mixture on top of each slice (I used my small cookie dough scoop to do this). If doing this, you will almost certainly need to do the paper towel on top of the cottage cheese method to sop up some liquid first, otherwise the mixture will want to slide right off the starfruit slices (also, it's not a bad idea to dry the top of the starfruit too). For a "help yourself" dish, place the cottage cheese mixture on a small serving plate, then arrange the starfruit slices around the edge. Throw a few whole basil leaves in the center for garnish if desired. For serving sizes for IBS/GERD sufferers, this is about the greatest thing ever. You can have a sizable amount of cottage cheese and even starfruit "chips", and the entire container of cottage cheese is 4 servings, so technically, you could have 1/4 of the cottage cheese mixture (but that's quite a bit, so I would recommend a little bit less than that). The Low FODMAP diet rules say no more than have no more than 94g of starfruit per serving, so it's a good idea to weigh the slices before to get an idea of how many you can have. It should be about 4-6 slices, depending on the size of the fruits you got and exactly how thick you cut them. Note: This recipe tastes best the day it's made. Something weird happens with the papaya/basil flavor fusion overnight and it gets a bit of a strange aftertaste. So if you want to make individual portions, cut up papaya ahead and keep in an air tight container in the refrigerator, then cut quantities of the recipe down accordingly and add the papaya and basil when you'll be eating it.